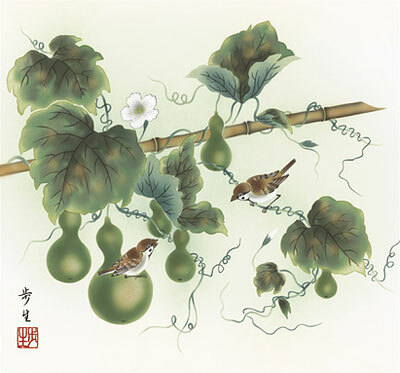 Bird and flower painting scroll Kacho-ga "Six Gourds and sparrows in a short roll"
Six Gourds and sparrows in a short roll. The original picture of this one is drawn by Kitayama Busyou. This natural blue gray frame is bringing out the gourds and leaves. It looks like a coolness, so it is hanged in the summer. The picture means the summer season. HYOUTAN: Six gourds means "keeping the health". SUZUME: A sparrow is appearing everywhere in Japan.